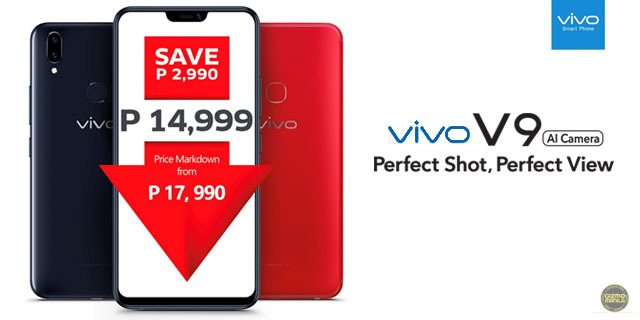 Home / sale / smartphone / vivo / Vivo V9 now made more affordable at PHP 14,999. Vivo V9 now made more affordable at PHP 14,999. Vivo kick-off August with the announcing a good news! as they lower down the price of Vivo V9 from PHP 17,995 to PHP 14,999. You can now enjoy the Vivo V9's 24MP AI Selfie Camera, 16MP + 5MP Dual Rear Camera in a 6.3-inch Full-view display at a lower price. Not only that, the Vivo V9 is also a perfect smartphone for gamers with the upgraded AI Game Mode. The Vivo V9, after all, is powered by the Android 8.1 OS and the Qualcomm Snapdragon 626 octa-core processor. It is also equipped with Smart Engine that intelligently allocates and optimizes processing resources, for a seamless gaming experience.